Mooove over, pardner, and make room for this here Texas Longhorn in yer corral. 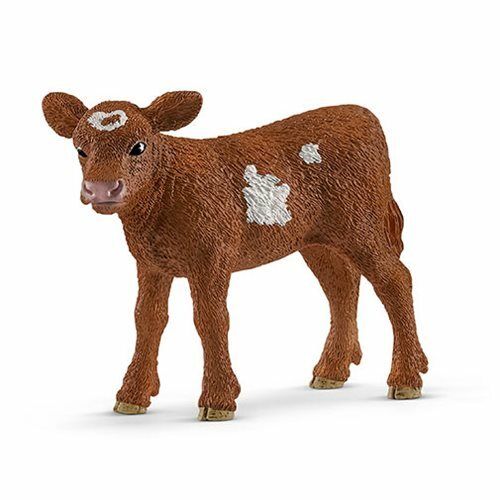 Cute as a button and realistic as can be, this Farm World Texas Longhorn Calf Collectible Figure measures about 2 3/4-inches long x 2-inches tall. Order yours before it scampers off! For even more fun, collect and play with all the finely detailed Schleich Farm World playsets and figures. They encourage children to play and learn at the same time! Each sold separately. Texas Longhorn calves are lighter and slimmer than the calves of other breeds. However, they develop so quickly and so well that they weigh just as much as other cattle when fully grown. Nevertheless, they do not require any special care or food. They're undemanding and very popular with farmers and ranchers because of their peaceful nature.